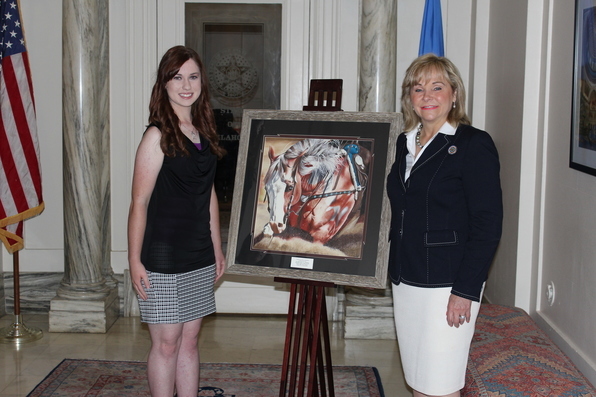 OKLAHOMA CITY – Governor Mary Fallin today welcomed Kaitlyn Haught to the state Capitol to celebrate the artist’s success in the inaugural Western Governors Association (WGA) “Celebrate the West” regional art competition. The drawing will displayed in the lobby of the governor’s office at the Capitol for the next 30 days. Haught’s drawing was one of more than 200 entries in the WGA contest, which drew from 19 Western states. WGA staff selected the winners from each state, then the governors who attended the association’s summer meeting in Jackson Hole, Wyo., picked the “Best of Show” winners. Haught’s drawing won a $500 prize for finishing in second place. "I have always loved horses, and I want to be able to show the power and the beauty of them in my artwork,” she wrote on her entry form. “This piece means the world to me, and I want the world to be able to appreciate its beauty as much as I do." Haught, who plans to attend Oklahoma Panhandle State University in the fall to study computer graphics and animation, said she has been drawing since she was 2. Haught said her drawing always has been an outlet for her imagination. She started by copying her mother’s sketches and borrowing as many drawing books and animal encyclopedias as she could from the local library. She credits her art teacher, Joshua Muller, with showing her all of the media available to her and encouraging her to enter her work in competitions. Her work earned top prizes in Texas County, Woodward and Mooreland, before she set her sights on a larger competition. Haught said she spent a total of three months working on her “Cutting Horse” drawing, hoping to qualify for a competition in New York. That didn’t work out, but the drawing did win best in show at the Panhandle Area Art Jubilee in April before earning second place in the WGA competition. For more information about the WGA art competition, click here.